Former Ohio Supreme Court Justice Evelyn Lundberg Stratton said today that she has changed her views and now opposes capital punishment. 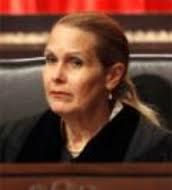 Stratton, a Republican who left office late last year, told members of an Ohio Supreme Court task force reviewing the death penalty, said while she did not have a strong feeling about capital punishment while serving on the court, her views have changed now that she’s retired. She is an attorney in private practice in Columbus. "I have evolved to where I don’t think the death penalty is effective," she said in an interview. "I don’t have a moral inhibition....Overall, it’s just not the best way to deal with it on a number of different levels." Stratton said she has long opposed executions involving mentally ill defendants, but she now opposes capital punishment in general because she doesn’t see it as a deterrent and victim families don’t gain the finality they seek when the murderer is put to death. Stratton said she would still have objections even if many of the issues being reviewed are resolved by Ohio Supreme Court task force studying the issue. The former justice was asked to speak to the task force, which includes judges, prosecutors, public defenders and others, to discuss her abiding concerns about mentally ill defendants in capital punishment cases. "The fact that Justice Stratton, a conservative former Supreme Court judge, believes our system can't be fixed is significant," said Kevin Werner, executive director of Ohioans to Stop Executions. Justice Paul E. Pfeifer, a sitting Republican justice on the court and one of the original sponsors of Ohio’s current death penalty law, announced two years ago that he opposes it.